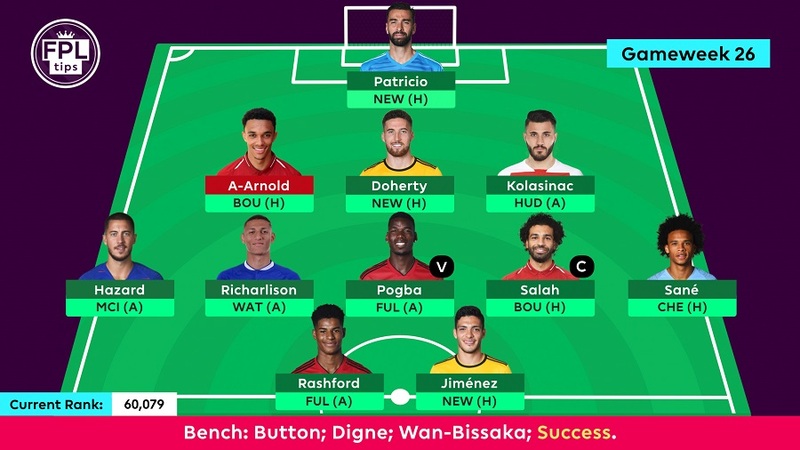 FPLTips' Team Selection - Gameweek 26 | Move For Son? Tottenham’s Heung-Min Son continues to deliver, but have we missed the boat on the attacking midfielder? Heung-Min Son would be a great addition to the team ahead of Gameweek 26, as Spurs welcome Leicester to Wembley, while Eden Hazard travels away to Man City. Leroy Sané is also a small concern after being an unused sub against Arsenal but he still has the Everton game to potentially turn things around. Although Mendy’s return could spell further rotation for the German in the coming Gameweeks. Aubameyang is also firmly on the radar, however, and using the 1 available free transfer this Gameweek would mean spending 4 points to get the Arsenal forward in to captain next Gameweek. For that reason, no transfer has been made as of yet, but be sure to check back later in the week to see if any moves takes place. Wolves (5) have kept just 1 clean sheet in the last 4 Gameweeks but only Liverpool (4), Man City (3) and Spurs (2) have conceded fewer big chances in that time. They face a Newcastle side that have scored just twice in their last 4 away trips; only Bournemouth and Huddersfield (each 1) have scored fewer goals in that time. Trent Alexander-Arnold was scheduled to return to training this week and could be back in contention for the meeting with Bournemouth but if he fails to recover, Lucas Digne and Aaron Wan-Bissaka are both available on the bench. Sead Kolasinac faces a Huddersfield side that have failed to score a single goal in the last 4 Gameweeks, attempting fewer shots (34) than every other team in that time. As mentioned before, Eden Hazard could make way before the away trip to Man City, with Guardiola’s side having allowed just 5 goals in 7 games against the ‘top six’ this season. The Belgian has been directly involved in 3 goals (1 goal, 2 assists) across 6 appearances against the ‘top six’, returning an average of 4.5 points per match but two of those contributions came against Man City in the reverse fixture. Richarlison has only 1 return from his last 6 matches but only Mané (13) and Pogba (18) have taken more than his 13 shots inside the box during that period, amongst midfielders. Watford have only shipped 3 goals in the last 4 Gameweeks but they’ve conceded 10 big chances in that time, with only Brighton (12) affording opponents more. Liverpool have dropped points in their last 2 matches and will be looking to take full advantage of their home fixture against Bournemouth, a side that have conceded 18 goals in their last 6 away matches; 3 more than any other side. Mohamed Salah has been involved in 4 big chances in the last 4 Gameweeks; only Barnes, Brooks (each 5) and Jota (6) have had more. Liverpool’s recent results have made things very tight at the top of the table and Man City can continue to pile on the pressure with a win over Chelsea. The Blues have conceded 10 goals in 6 games against the ‘top six’ this season and they’ve shipped 6 without reply in their last 2 away matches, against Bournemouth and Arsenal. Leroy Sané has created 3 big chances in the last 4 Gameweeks; only Groß and Jiménez (each 4) have produced more. 9 shots on target by Marcus Rashford in the last 4 Gameweeks is level with Paul Pogba’s tally; no player has taken more than the pair. The 21-year-old has returned 5 goals and 2 assists in the last 6 Gameweeks, scoring in all but one game over that spell. Raúl Jiménez secured his 16th goal involvement of the season last Gameweek and only Salah (58), Agüero (61) and Mitrovic (63) have fired more than his 57 shots inside the box. Only Man City have matched Wolves’ total of 10 goals scored in the last 4 Gameweeks, with no team producing more. Paul Pogba and Marcus Rashford could be contenders for captaincy, as they continue to find returns and show promising underlying numbers under Solskjaer, but it’s hard to overlook Mohamed Salah for the armband, as Liverpool welcome Bournemouth to Anfield. Despite the recent wobble, the Reds have scored a league-high total of 14 goals in their last 4 home matches, with only Man Utd (32) producing more than their 30 efforts on target in that time. 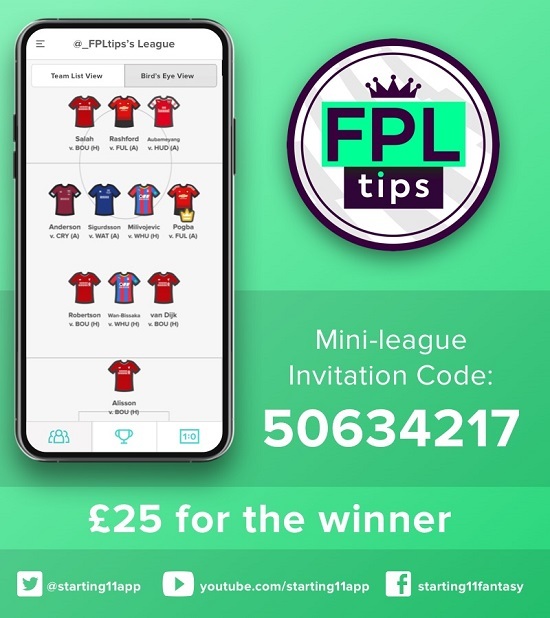 BEFORE YOU GO… We’ll be giving away £25.00 in cash to the winner of FPLTips’ SATURDAY ONLY Mini League on Starting 11 this week.